A high-output, true single-coil pickup for warm-toned, 7-string guitars that's ideal for playing Texas blues rock, classic rock, and heavy rock. The Seymour Duncan Custom Staggered SSL-5 7-string pickup provides a distinct vintage tone with greater sustain and full sounding harmonics. The pickup cuts through the mix but also cleans up nicely when you back off the volume. The Custom Staggered SSL-5 pickup's 6-string counterpart has been championed by countless artists over its long history for its strong, overwound Strat tone. 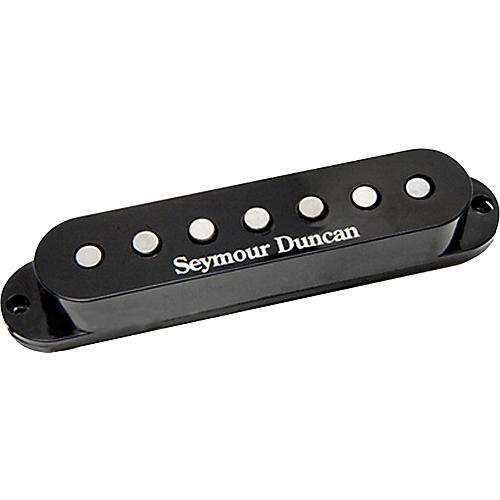 The Seymour Duncan Custom Staggered pickup recently appeared on Fender's David Gilmour Signature Series Strat. Pair the Seymour Duncan Custom Staggered SSL-5 7-string pickup with a high-output bridge pickup like Seymour Duncan's SH-10 Full Shred 7-string, and a moderate output neck pickup like Seymour Duncan's SH-2n Jazz 7-string for a great tone when playing Texas blues rock, classic rock, and heavy rock. Though it looks like Seymour Duncan's SSL-1 and has that distinct vintage tone, the SSL-5's overwound coil yield higher output, more sustain, and greater harmonics. Calibrated set available from Seymour Duncan with RW/RP (reverse wound, reverse polarity) middle pickup. Many players use Seymour Duncan's SSL-5 in the bridge position with vintage output pickups, like Seymour Duncan's SSL-1's in the neck and middle for tonal versatility. Rock your Strat with higher output, more sustain, and greater harmonics when you order the SSL-5 for your 7-string today.